You may have seen my recent blog about the launch of the new Holland & Barrett More store in Chester. Oh how I wish I lived in Chester – the new More Store there is A-Mazing. It is like an Aladdin’s cave for freefromers, packed full of products you may not have discovered before. This week I’ve been looking at some of the new Holland & Barrett products that are totally freefrom nuts, dairy, soya and wheat so listen up coeliacs out there – many of these products will be suitable for you too (always read the label). Hopefully you will discover something new to try or rediscover some old favourites like I did too. 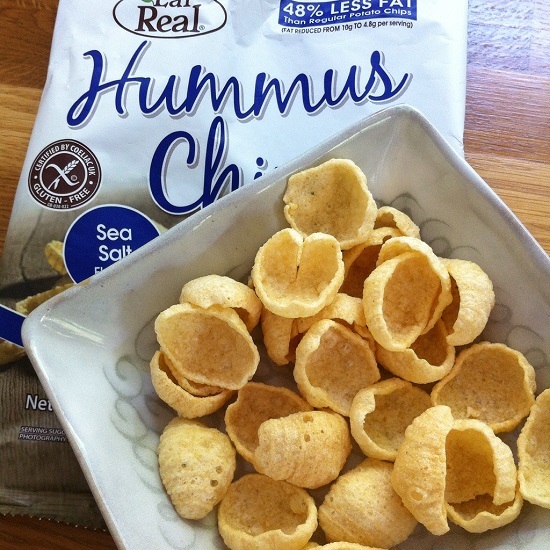 What’s not to like with these Hummus crisps from EatReal? 48% less fat than regular crisps and also #glutenfree #vegetarian and #vegan. They are also #dairyfree #soyafree and #wheatfree. So far ticking all the boxes for me. I LOVED these hummus crisps. They are crunchy, tasty, not too salty and REALLY moreish. These were the first thing we sampled. No sooner had they been lifted from the box they found themselves poured into a bowl and devoured. They are really delicious and I will definitely be buying these again. I think they come in other flavours but I’m usually a plain or ready salted gal myself so these were perfect for me. Ingredients include: Chickpea flour (45%), Rice, potato starch, vegetable oil (rapeseed), corn flour, sea salt. They would be great to scoop up dips, humous etc. but these little crisps didn’t last long enough to be so useful. These biscuits passed not only the taste test but also the dunk test. They made it to three seconds without dumping crumbs into the mug of steaming tea. The raspberry flavour ones had a subtle fruity flavour and chewy bits of dried raspberry inside. 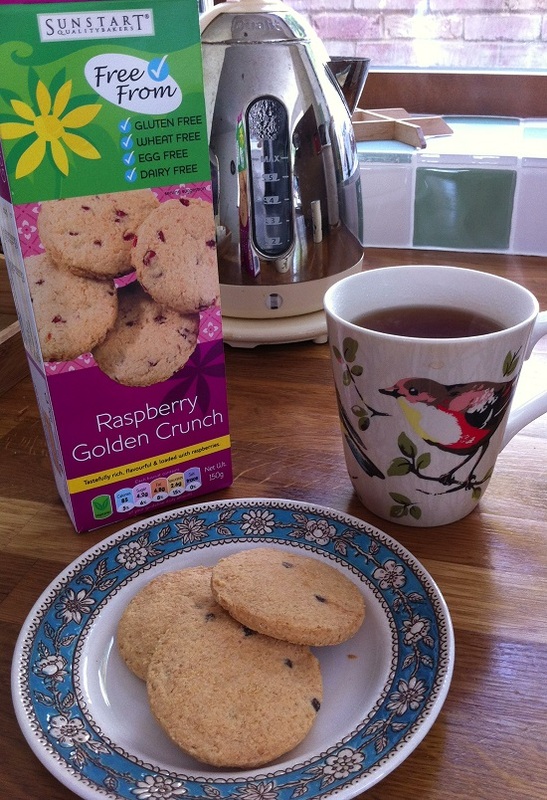 The Golden Crunch were one of the closest things I’ve come across to the much missed shortbread biscuit. Ingredients for the Raspberry Crunch include: Maize starch, margerine (vegetable oil, annato, curcumin, emulsifier, natural flavouring), sugar, raspberry flavoured pieces (15%) (raspberry pulp, (35%);sucrose; apple; pineable fibres), coconut (10%), brown rice flakes, millet flakes, potato starch. They lasted one more day but not for long. They’re too good and had to be eaten fresh. If you love cake you’re gonna really enjoy this Mrs Crimbles Dutch apple cake. This cake has actually been around for some years now, I’ve had it before, but I haven’t had any for some time. Rediscovering this delicious cake was a treat. 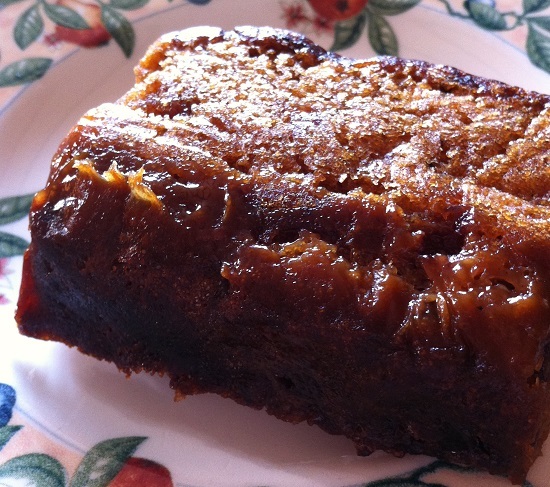 It is so moist and gooey and the layer of caramelised apple on the top is just devine – the best bit of the whole cake. This cake is wheat free but does contain rye flour so is not suitable for coeliacs. It is however completely egg free, unusual and hard to find in cakes so also suitable for anyone with an egg allergy. Ingredients for the Dutch apple cake: Rye flour, glucose-fructose syrup, fruit (17%) (raisins 7%, melon 5%, apple juice 5%), sugar, water, spices (of which cinnamon 0.7%), raising agents – sodium hydrogen carbonate and sodium acid pyrophosphate, flavourings, salt, acidity regulator – citric acid. Suitable for Vegetarians and Vegans. I really thought this was real chocolate until I read the ingredients. This amazing Choc Shot, made by the magicians at Sweet Freedom is actually made from carob and fruit so for anyone allergic to chocolate this is a great alternative. On the bottle they suggest making a hot drink by mixing 3-4 tsp per 200ml milk. Just stir into hot milk. It would also go well drizzled over porridge, cereal, fruit, yoghurt, ice cream, pancakes and spread on toast… if you love chocolate you’ll know what to do! Just tip your head back and squirt in a mouthful! 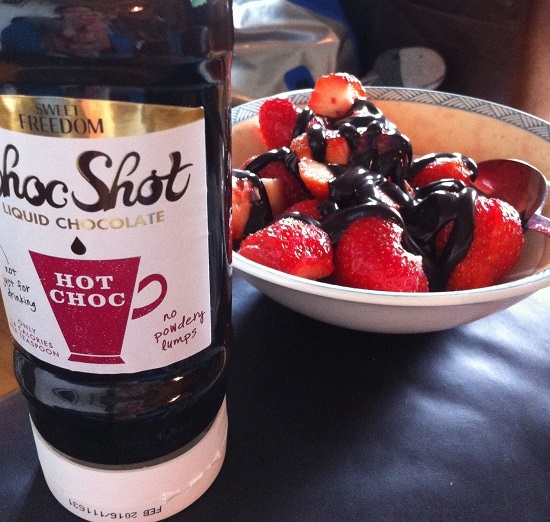 I had it smothered over a bowl of fresh strawberries – perfect! Sweet Freedom® (natural fruit extracts; apples, grapes & carob), water, cocoa, rapeseed oil, natural chocolate flavour. The black bean spaghetti was the only thing that didn’t go down too well in our household. Having issues with kidney beans, broad beans and peanuts maybe I shouldn’t have tried this new product made from another legume, black beans. However, for anyone who is coeliac or wheat allergic who can tolerate legumes it could be something different to try. It didn’t agree with me at all but I won’t bore with the gory details here. Use your imagination! Mr What Allergy tried a mouthful and said it just tasted quite bland. I found it a little odd since the colour when cooked is a little grey looking but with some sauce and seasoning it could add a new dimension to a meal. It is just made with beans so is completely gluten free, wheat free, dairy free, soya free, nut free, egg free. Completely freefrom! is going to have to be a treat to come and I am hoping to get in some help and make chocolate with friends. Any takers? I’ll be doing this some time next week or two when it’s perhaps not so hot and sticky so get in quick. Click here if you would like to see Holland and Barrett’s FreeFrom range. 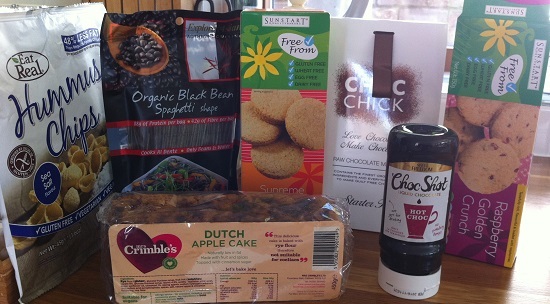 And thank you Holland and Barrett for reuniting me with a few old favourites (Mrs Crimbles Dutch apple cake and Sweet Freedom) and introducing me to some new ones – all the rest! Which ones will I be buying again? Definitely the crisps, the chocolate sauce and the apple cake. Possibly the biscuits on special occasions but I’m not a huge biscuit eater, however if I was buying biscuits these would be up there with my favourite Oats and Syrup oat cakes. Happy freefrom eating everyone, but please always read, reread and triple check ingredients on anything you try. Stay safe.